A treadmill for camels? Is that serious? It's very serious! Camel racing is the sport of sheiks. Nothing is too good for those camels. According to Brian Gay, HydroCo's founder and Managing Director, "SPLat has been a key element in our success". When Melbourne company HydroCo landed a contract to supply a camel treadmill to Qatar's Sheik Tamim, they turned to SPLat to supply the electronic controls. Not surprising, really, as we have been making all HydroCo's, and its predecessor companies´, electronic controls since the mid 1980's. A treadmill for camels? Is that serious? It's very serious! Camel racing is the sport of sheiks, and nothing is too good for those camels. 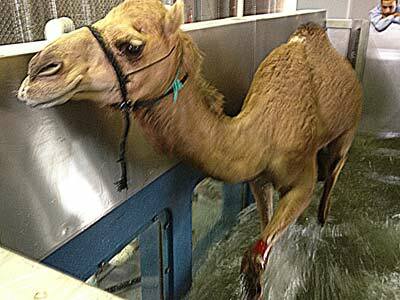 HydroCo's ThoroughTread underwater treadmill allows camels to exercise while partially submerged, which been found to be very beneficial. The ThoroughTread was originally designed and built for the rehabilitation of horses, and has been featured on Australian TV program New Inventors. The SPLat control system for the ThoroughTread consists of two custom designed controller boards, and two (different) custom designed user interface boards with buttons, LEDs and readouts. The configuration can also include an off the shelf SX10506 pressure sensor board for water height measurement. The various boards are networked together with a mixture of industry standard ModBus and our proprietary Xwire. Different HydroCo products use variously custom and off the shelf SPLat controllers. All the programming is done by SPLat, and we work very closely with HydroCo during their product development. According to Brian Gay, HydroCo's founder and Managing Director, "SPLat has been a key element in our success".